Garmin, a legendary name in the world of GPS, has always made some of the better fishfinding options money can buy – but when the very first STRIKER Series fishfinder GPS unit was released anglers all over the world were more than a little bit skeptical about whether or not this “bare-bones” option was going to be worth investing in. Right out of the gate, the original STRIKER Series fishfinder units – and the STRIKER units sold today – were essentially stripped down versions of the ECHOMAP Plus series of fish finding tools available from this company. Sure, they did and continue to feature the most advanced CHIRP Sonar capabilities available, but they didn’t include any onboard maps or data storage capabilities to keep the price down. Well, the market definitely answered and this fishfinder continues to be one of the best selling options ever since the first day they were released for sale. The latest version of the STRIKER Series – the Garmin STRIKER Plus 7sv – continues the trend of stripping down non-essential features and instead focusing completely on the fish finding capabilities of these units. Wi-Fi capabilities are cooked right into the Garmin STRIKER Plus 7sv as well, allowing this unit to be updated on-the-fly but also allowing it to be paired with smart devices – cell phones and tablets – while out on the water to dramatically extend the overall capabilities this system. QuickDraw Contours from the folks at Garmin allow you to take full advantage of only the best lives sonar mapping features available in any commercially available fish finding platform. You’ll be able to store up to 2 million acres of 1-foot contour data on the new STRIKER units. Active Captain mobile application integration gives you the ability to compare your smartphone (Android and iOS devices are compatible) with the Garmin STRIKER Plus 7sv unit itself, allowing you to squeeze extra performance out of the technology you have helping you find fish while also tying you back into the STRIKER community to get even more out of this fishfinder then you’d have been able to alone. It’s a really, really hard not to be incredibly impressed by the sonar technology the folks at Garmin have rolled up into the new Garmin STRIKER Plus 7sv. Taking advantage of only the most advanced CHIRP Sonar systems available right now, this system provides high-definition 2-D sonar information at between 150 and 240 kHz while utilizing a CV52HW/TM transducer. This puts a lot of active sonar information into your hands at any one particular point in time while you are out enjoying everything that the fishing has to offer. You’ll be able to take readings at incredible depths, enjoying the kind of accuracy that most other fishfinding options – at this price point and considerably higher – couldn’t dream of producing. With the active QuickDraw Contour DIY live mapping solution you’re also going to be able to produce your own fishing maps. And since you are able to store and record more than 2 million acres worth of information before you have to begin rewriting the files, you’ll be able to create your own in-depth data that you can refer to time and time again to improve the fishing you set out to do (particularly in your favorite spots). The Wi-Fi connectivity and the Active Captain application are game changers in the fish finding world, putting the power of your smartphone or tablet to use with its Wi-Fi connection by pairing it to your fishfinder. You’ll be able to use the data that you are pulling from your Garmin STRIKER Plus 7sv (live and in real time) with a whole host of approved third-party applications and with the Active Captain application itself, increasing the utility of this fishfinder dramatically without increasing its price or storage capabilities at all. 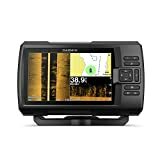 This really transforms a relatively bare-bones (if not powerfully capable) fishfinder into something special, and something that you would never have been able to find anywhere close to this price point without the possibility of the mobile device pairing technology. While the Quick Contour capabilities of the STRIKER series are fantastic in and of themselves, the fact that you cannot take advantage of preloaded maps or traditional mapping systems can be a bit of a pain in the backside. Sure, you’re going to be able to utilize those kinds of maps and mapping systems when you pair the Garmin STRIKER Plus 7sv with your smartphone or your tablet but it would have been nice seeing these kinds of capabilities available on the unit itself right out of the box. On top of that, some of the accessories available directly from Garmin that really flesh out the utility of the Garmin STRIKER Plus 7sv unit are a bit on the more expensive side of things. That’s to be expected, however – and really par for the course when it comes to accessories for fish finding units of this caliber – but it would have been nice to see some of these accessories a little bit discounted for the inexpensive STRIKER lineup. All things considered, you really aren’t going to be disappointed if you choose to move forward with the Garmin STRIKER Plus 7sv as your primary fish finding technology. Somewhat bare-bones compared to some of the other feature-rich – and sometimes all too confusing to utilize – fishfinder options, this is an anglers best friend for a number of real and tangible reasons that you will begin to understand just as soon as you fire it up out on the water for the first time yourself. There was a lot of doubt about the success and viability of the STRIKER Series fishfinder options when they first hit the market. But today that they are some of the best options money can buy, some of the most well-regarded units available, and definitely a savvy investment for the serious fisherman or angler that isn’t looking for a lot of bells and whistles but just wants to find more fish without any hassle or a headache. You can’t go wrong with the Garmin STRIKER Plus 7sv!